Ultimate Rare (アルティメットレア Arutimetto Rea, or simply Ultimate) cards have an "embossed" foil on the Card Artwork, including the borders of artworks, Attribute icon, and on Monster Cards, the Level stars. The card name is printed gold, like an Ultra Rare. When scanned, the embossed image may be muted and the image indistinct from the background. This card rarity is very hard for Scalers to find, since the card has a weight comparable to that of a Common. Ultimate Rare cards usually also come in a less rare variety that can be found in the same booster with the same card number. OCG Ultimate Rares tend to scan much better than their TCG counterparts, due to a slightly reflective coating present on all OCG cards (but lacking on TCG cards). This has the advantage of brightening the image, and making the foil image more distinct than on a TCG equivalent. In the OCG, Ultimate Rares have been known to be printed as independent rarities, while they are used exclusively as an additional Booster Pack rarity in the TCG. When they were first introduced in the TCG, Ultimate Rare cards often only had partial foil on the Card artwork, usually the background. Starting partially in Soul of the Duelist and from Enemy of Justice onwards, the entire picture would be embossed in foil. From Duelist Revolution onward, the card border and the lore text border are embossed in foil as well. 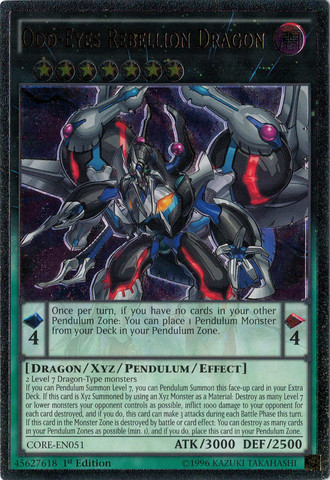 Also, with the introduction of Pendulum Monsters, the Pendulum Scales are embossed in foil too. On the market, Ultimate Rare cards are often much more valuable than others, even if their effectiveness in the game is only above average. However, Ultra Rare versions of cover cards are usually more popular than that of their Ultimate Rare counterparts. Also, some Ultimate Rare cards have a pattern in their foiling, such as stripes in fire, or a curvy pattern in some backgrounds. While subtle, it's an interesting addition to some Ultimate Rares. Starting with Breakers of Shadow, Ultimate Rares are moving exclusively to tournament packs. See also: "List of Ultimate Rare cards"
↑ Tewart, Kevin. "Booster Pack Changes in 2016". Konami. Retrieved September 17, 2015. This page was last edited on 27 April 2017, at 17:40.